With the holiday season right around the corner, many people are wondering what gifts or stocking stuffers to purchase for their loved ones, friends or significant other and I may have a solution that will solve your problem—Anthony Hamilton. The R&B superstar has been ‘sleighing’ hits for the past decade and now Hamilton is ready to sleigh in the holidays with a new CD, “Home For The Holidays” and it comes right on time and this album certainly puts you in a cheerful and loving mood! Hamilton is known for his love ballads and he certainly doesn’t disappoint with his latest point blank. The album opens with “It’s Christmas” and you instantly feel the love Hamilton is singing about as he sings about how the holidays are meant for couples. One of the things I particularly like about Anthony Hamilton is his humble up-bringing as he has never been shy about his past, as he oftentimes sings about living in poverty. “Santa Claus Go Straight To The Ghetto,” is a song where he makes no shame or apologies about his past and even make reference to his future. The song is really catchy and upbeat and I must admit—it’s one of my favorites on the album. 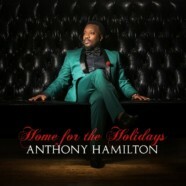 The album’s title track, “Home For The Holidays” is a soft and romantic song. This song is truly for the couple’s in love and even if you’re not in a relationship, it will make you want to cling even tighter to your loved ones or at least give you the illusion that you’re in love. As an avid old school R&B music fan, I was particular excited to see there was a remake of The Emotions classic song, “What Do The Lonely Do At Christmas?” Hamilton sincerely put his heart into this song and it’s quite in great comparison to the original song. A talented song writer at right, Hamilton also penned a few original tracks for his first Christmas album. “Coming Home” was a very good original song as Hamilton sings about not missing Christmas this year due to his busy travel and tour schedule. He also sings about wanting to make love to his wife on Christmas and that gives him an even more reason to come home. Anthony Hamilton has yet to disappoint me with his music. I first got wind of Hamilton in 2003 when he released his sophomore CD, “Comin’ Where I’m From” and I have been hooked on him ever since. What Hamilton lacks in height, he certainly shows great abundance with his sound. He is a great live performer and will leave any crowd amazed and at awe. Home For The Holidays is worth the purchase. Hamilton has nothing to prove to the music industry as his credentials and many awards speak for itself but this album is just even more proof of it.